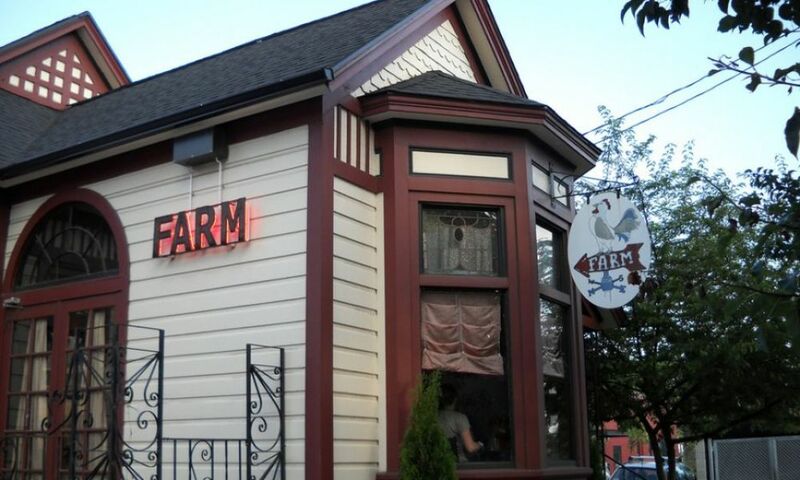 Founded by Fearn Smith and Guy Weigold, The Farm Café prides itself on local, organic and fresh ingredients. On that foundation, Executive Chef Kelly Weiss and crew create memorable dishes every night, maintaining the restaurant’s popularity since its opening in 2003. Although the name suggests a pastoral location, this is the city, and more specifically Southeast Burnside. What the name does accurately portray is their close relationships with farmers and producers. They focus mainly on vegetarian dishes, but there is also mouth-watering meat on the menu, sourced from local ranchers, of course. Adding to the restaurant’s farm “street cred,” the wine list looks like it came from wine country, a rare distinction in Portland, where we awarded only 20 honorees out of the hundreds of restaurants in the city. From bottles to glass pours, the list often features Oregon’s newest and smallest producers alongside other local selections. Weigold and Smith are firm believers in exposing the entire staff to wine country, where they take “field trips” every year, tasting from barrel and meeting the people who make the wine. The Farm “gets it,” the vital relationships between restaurants and local producers, including winegrowers, which is why they “get” a well-deserved Regional Star Award.